Exchange visitors come to the U.S. to pursue short term work or study exchange programs. For many exchange visitors, a visit to the U.S. turns into an opportunity for long-term success in the U.S. Unfortunately, the U.S. generally imposes a requirement that J-1 exchange visitors return to their country for a minimum of two years before returning to the U.S.The two-year home country physical presence requirement can create what feels like an eternity of time between stays in the U.S., and thus many exchange visitors look for an option to stay. What follows is a general tutorial on the procedure to apply for a waiver of the exchange visitor home-country physical presence requirement and a no objection statement from your embassy. The application for a Waiver of the Exchange Visitor Two-year Home-country Physical Presence Requirement requires payment of a $215 filing fee (on last review of USCIS policy). To apply for a J-1 Waiver, you must 1) complete the online J Visa Waiver Recommendation Application; 2) Mail your Waiver Application and Fee Payment; 3) Submit Supporting Documents; 4) Check your Waiver Request Status and Update your Contact Information; 5) Provide extra information if the WRD needs more information from you; 6) Wait the necessary processing time; 7) Receive the Department of State Recommendation and Final Determination by USCIS. Alien Registration “A” number (if applicable). We recommend that you prepare you answers to the following questions beforehand, and then cut and paste the answers into the online application. Otherwise, your session may time out (after 60 minutes) and you may lose your data. No objection statement. Without a no objection statement, applicants must satisfy the two-year foreign residence requirement of Section 212(e) of the Immigration and Nationality Act and return to his or her home country. State Health Agency Request. If you are a foreign medical school graduate, who has an offer of full time employment at a health care facility and are working in an area experiencing a designated shortage of health care professionals, you may be eligible to apply for a waiver. Please note, to fully qualify for a waiver on this basis, you must agree to begin employment at the health care facility within 90 days of receiving the waiver, and sign a contract to continue to work at the facility full time for no less than three years. Please note that the law permits only medical doctors to apply for a waiver on this basis. However, if the exchange visitor’s government funded their program, the EV must also request a “no objection” statement from the country to which they are otherwise obligated to return. Request by IGA. If you are working on a project for, or of interest to, a U.S. Federal Government agency, and that agency determines that your contribution and stay in the United States is vital to one of its programs, you may apply for a waiver. Please be advised that your continued stay in the United States must be in the public interest. Please note that if you are a foreign physician who agrees to serve in a medically under-served area, please refer to the Federal Register Volume 62, No. 102 of May 28, 1997 for additional information. Exceptional Hardship. If you, the exchange visitor, can demonstrate that your departure from the United States would cause exceptional hardship to your United States citizen or lawful permanent resident spouse or child, you may apply for a waiver. Please be aware that mere separation from your family is not considered to be sufficient to establish an exceptional hardship. Persecution: If you believe that you will be persecuted upon return to your home country because of your race, religion, or political opinion, you can apply for a waiver. Before submitting the application, verify that all of your information is correct. After you submit your information, a new case number will be generated for you. 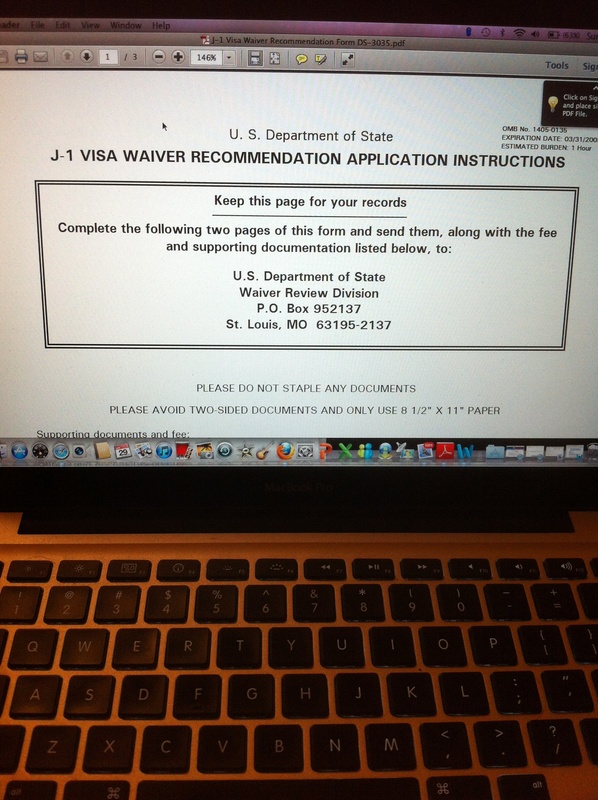 Once you hit the “display” button, your visa waiver packet will generate; save it first, then print it. Please see the attached sample print out. Make a copy of all of your DS-2019 or IAP-66 forms; and a copy of the data page of the EV’s current passport containing your name and birth date. Wait for your WRD assigned case number and additional instructions using your SASE. You should receive instructions to submit documents or other information. Your home country’s government must issue a No Objection Statement through its embassy in Washington, DC, stating that it has no objection to you not returning to your home country to satisfy the two-year home-country physical permanent resident. Contact the consular section of your embassy in Washington, D.C. to request that a “no objection” statement be forwarded to the Department of State on your behalf. Send all such documents required to your embassy in Washington, D.C. The letter of No Objection Statement will be sent to the U.S. Department of State Waiver Review Division after embassy processing. For more answers to your questions, contact MIA at abernhard@miamivisahelp.com or Miami International Attorneys at www.miamivisahelp.com. Welcome to MiamiVisaHelp.com’s law blog … discussing everything visa from the perspective of those that have a need, desire, or tendency to move from country to country for the purpose of work, survival, education, living, play, and everything in between. Please feel free to send Andrew John Bernhard, Esq. a message! We are always trying to enhance your experience, and help all of us movers, migrators, immigrants, ex-pats and travelers have an easier, happier, and more satisfying experience in the often confusing world of U.S. Immigration. Please feel free to visit our friends at USImmigrationMiami.wordpress.com and TheMitochondrialMigrator.wordpress.com to see more from similar minded people like yourself! Most of all…ENJOY! - Andrew John Bernhard, Esq. Today Bernhard Law Firm won dismissal for two Brazilian clients in a $ million dollar lawsuit to guaranty a South Beach commercial lease.